Pangandaran on the south coast of West Java has a bit of a Jekyll and Hyde personality—sleepy fishing village midweek and Java’s principle beach resort on weekends and public holidays when it can get so packed with humanity you’d swear the entire population of Java’s 145 million inhabitants had descended here at once. Near the border of Central Java, it is approximately eight hours by road from Bandung and Yogyakarta respectively, and ten hours from Jakarta (although times can double when the traffic is busy). Regardless of the distance, locals predominantly from these three cities arrive en masse to paddle in the surf, eat cheap fresh fish and play games on the sand. Pangandaran’s tiny teardrop peninsular which harbours a jungle covered nature reserve is surrounded by the Indian Ocean. The cape has a palm-fringed blackish-grey sand surf beach on the west side yawning away into the distance kilometre after stunning kilometre called somewhat unimaginatively West Beach or Pantai Barat and a seawall on the eastern side—East Beach or Pantai Timur. They call it a beach, but in truth there is nothing of the sort since a tsunami ripped through the village in 2006, causing hundreds of deaths and washing away what little there was of the sand. Pangandaran is often touted as the local alternative to Bali and the similarities to Bali’s Kuta are not unwarranted, namely the jumble of ugly unregulated hotel blocks and beaches littered with plastic. Despite that, a constant stream of surfable waves crashing into the shoreline are the reason that this place is on the foreign tourist map in the first place, and midweek it has a tranquil relaxing charm and is a decent spot to enjoy walks on the beach or have a drink in one of the many beachside bars. The beach is not always great for swimming due to the gutsy swell and dangerous rips so be wary and swim in patrolled areas, but is a wicked spot to get on a board. Pangandaran’s long arching western coastline stretches eight kilometres to the lagoon, plus a further ten passing Batu Hiu Beach almost to Batu Karas peppered with close to year-round consistent beachbreaks. As the bay widens, the bigger and more powerful the waves, better for experienced surfers only. Closer to the main town and nature reserve, smaller cleaner waves are more suitable for intermediate and beginners and it’s not a bad spot to learn. Around the point of the nature reserve are three reefbreaks Batu Layar with a long right, Batu Mandi, a fast hollow left and Pasir Putih, a longer shallow left. You might want to have a few waves under your belt before you give the reefbreaks a go. Another right hander on East Beach needs a big swell but when the winds are right, it’s pumping. Surf lessons and board hire are offered by friendly locals. Two hour lessons are around 250,000 rupiah. Aside from the waves, the untamed nature reserve is refuge to much easy-to-spot wildlife as well as a network of caves and provides some decent trekking. The nearby countryside offers a range of fun excursions including a stunningly picturesque river gorge called Green Canyon where you take a boat trip and swim in the crystal clear water, or for the more adventurous partake in body rafting. Similar activities are available at Citumang (Green Valley) and on the way you can learn about the local culture with a home industry tour visiting traditional puppet workshops, producers and markets. Further in the hinterland, up a winding hilly road about 11 kilometres northwest of Pangandaran in the mountainous area of Gunung Tiga near Cintaratu village, a lookout point known as Wonder Hill Jojogan enjoys sweeping views over the jungle covered hills above Pangandaran and out to sea. Rickety bamboo viewing platforms jut preciously over the cliffs offering the opportunity for Indonesian tourists’ favourite pastime, the selfie. A nominal fee is charged to enter the area although on the day we visited no one was around to take our money. Toilets and a warung selling snacks and drinks are at the site. Wonder Hill is the perfect spot to watch the setting sun. A further six kilometres away on the Santirah River, a bunch of companies offer inner tubes for hire for tubing down the rapids of this picturesque jungle shrouded river. 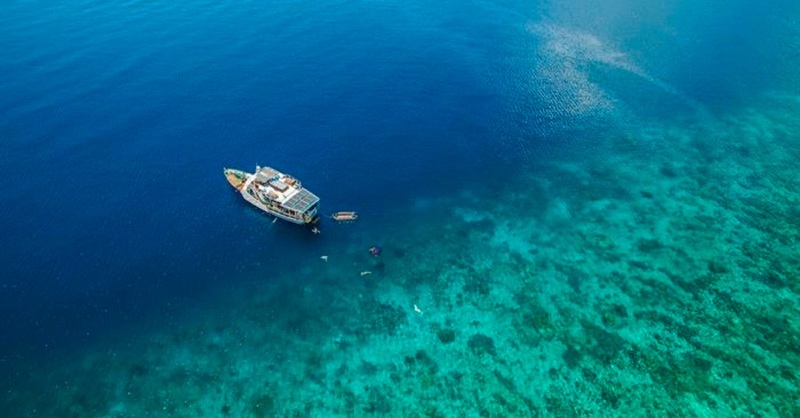 Depending on water levels the trip can take around two hours passing caves and waterfalls and costs around 125,000 rupiah which includes life jackets. Another terrific viewpoint closer to Batu Karas than Pangandaran is the headland at Batu Hiu Beach where the craggy bluff drops dramatic into crashing surf. Batu Hiu translates as shark rock, and you’ll recognise the area by the cheesy cement gaping jawed shark that forms the entrance gate, however the actual “shark rock” is out to sea off the cliff. Climb the hill to a grassy picnic area dotted with windswept pandanus trees for a spectacular view up and down the coast. Pangandaran is packed with a range of good value accommodation, but you’ll need to plan ahead for weekends and national holidays. Most of the sights around Pangandaran can also be easily visited from Batu Karas which has more of a laidback vibe and a growing number of places to stay, so you may consider sleeping there as an alternative. This seaside town is renowned for cheap, fresh seafood and the atmosphere is very local, but refreshingly so, with enough foreign visitors that Western food and beach bars are present too. If you’re into bustling streets and nightclubs you won’t find them in Pangandaran. The town is relatively quiet and conservative with nary a drunken lout to be found. That said, on weekends, the roads are throbbing with local tourists letting off steam in true Indonesian fashion riding mini trains and tandem bicycles complete with pumping karaoke! Public transport connections are long and slow, although you can fly into Pangandaran on SusiAir. Locally you can use pedal powered becaks or bicycles or for sights further afield, ojeks and taxis. A gateway south of the bus terminal divides the southern tourist area of Pangandaran from the northern “business end”. Here you’re greeted by a large blue marlin statue at the roundabout. At the gate an entrance fee is levied to tourists of 6,000 rupiah per person plus varying amounts for vehicles. You only need to pay this once, so hang on to your ticket. Three main roads run north to south along the narrow peninsula, Jalan Pamugaran Bulak Laut along West Beach where you’ll find many hotels and restaurants, Jalan Pantai Timur along East Beach and has access to most of the seafood restaurants and larger resorts and a central road, Jalan Kidang Pananjung which runs two kilometres from the gate to the nature reserve, lined with hotels, restaurants shops and amenities such as the post office, laundry services and travel agents. At its narrowest, it’s only 200 metres from East Beach to West Beach. The beachfront is lined with souvenir stalls and warungs, blocking the view of the sea entirely from the road, but these are all planned to be removed in 2018, the stalls into a new market area and the bars further west around the coast. The bus station is 200 metres from the entrance gate, and about one kilometre from the majority of the guesthouses. A becak from the bus station to most hotels and guesthouses is 20,000 rupiah. If you have not booked in advance, beware of any commissions the driver may seek, as this will inflate the price of your room. There are several ATMs around town as well as ATMs in Alfamarts and Indomarets. The local puskesmas (health clinic) has 24hour emergency and is located near the tollgate. The police station is near the main market and post office along the Jalan Kidang Pananjung. 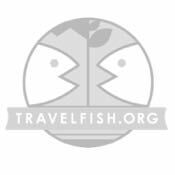 Please sign up as a Travelfish member to download the Pangandaran guide PDF (10.2 MB, 41 pages). Membership costs just A$35 per year (less than A$1 per week) and gives you access to over 250 PDF guides.  Use the above map to find specific destinations in and around Pangandaran which are listed on Travelfish. Bed icons indicate a guesthouse, hostel or hotel, the knife and fork is an eatery or bar and the four-way circular thingy marks sights, attractions and other points of interest. Click on any icon for a short pop-up and a direct link to the page for that spot. If you are in the area, use the teardrop icon near the top left to show your position on the map (you'll need to allow position sharing for this last feature to work).